The linguistic character of ancient Macedonia. Arnold Toynbee asserts that the Macedonians of all ancient historical periods spoke Greek. He argues firstly that "they (the Makedones) were already Greek speaking 150 years to 200 years earlier than Augustus' time." This observation would seem to be of little weight in the present discussion since we have already noted the increasing, and deliberately chosen, use of Attic Greek by the Macedonian nobility. The use of a language from a distant location by a limited number of noble families tells us nothing about the native tongue of the Macedonians of the fourth century B.C., the Anglo-Saxons of thirteenth century England, or the Prussians of early eighteenth century Germany. It is easy to find modern examples of the same phenomenon. Both France and Germany have many Celtic place names yet do not speak a Celtic language, or even the same language. The people of England are "British," a name based on a Latin word formerly applied to a Celtic-speaking people and now referring to an Anglo-Saxon people. A study of the word "British" does not help us to determine what language the British speak. It is certainly not Latin, yet there is historical evidence about the use of Latin in Britain, the same kind of evidence that is trotted out to prove that the Macedonians were Greek. For instance, since English coins have Latin on them, we might conclude that the British speak Latin, following the argument that it would not make sense to use a language no one could read on such common items. Similarly, many English parish churches have collections of epitaphs in Latin, dating from the Middle Ages. Classicist Andy Fear points out that most of the population of medieval England could not even read English, let alone Latin. Obviously, the significance of surviving Greek texts from Macedonia must be treated with caution. Fear notes, too, that Greek inscriptions from ancient Macedonia are in a mixture of Greek dialects. It is much easier to believe that this could occur if Greek was alien to Macedonia, instead of the common language. If the latter were the case, we might expect to see a consistent form employed.If we study the month names used in England and France, we can see that they resemble each other. This is not a basis for concluding that French and English are the same language. All one can reasonably conclude is that there has been similar heavy influence across these two languages. To say, for such superficial reasons, that Greek and Macedonian are the same language is to make far too much of a little thing. We must remember also that much of the history about ancient Macedonians that is passed on to us comes through Greek sources, and names are likely to have been shaped into Greek forms for a myriad of reasons, including the likelihood that Greek writers may not have been able to pronounce other tongues. A modern analogy would be to think that France is a German-speaking country because when reading a German textbook one comes across the name "Frankreich" ruled by, say, Karl rather than Charles. It is easy enough to find English forms of foreign place names that look far removed from their native form; Florence for Firenze, and so on. In 3200 BC, there were many, many languages spoken besides Sumerian and Egyptian, but they weren't fortunate enough to have a writing system. These languages are just as old. To take one interesting case, the Albanian language (spoken north of Greece) was not written down until about the 15th century AD, yet Ptolemy mentions the people in the first century BC. * The linguistic and archaeological evidence suggests that Albanians were a distinct people for even longer than that. 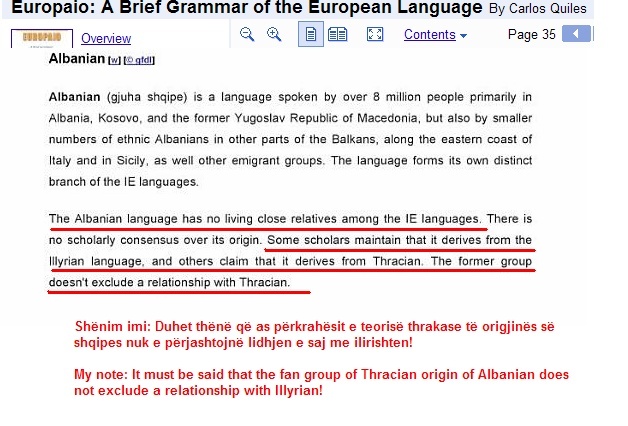 So Albanian has probably existed for several millennia, but has only been written down for 500 years. With a twist of fate, Albanian might be considered very "old" and Greek pretty "new". The ancient Macedonians were Illyrians just like the ancient Thracians. It has been proved that the Macedonian Kingdom began with the reign of Perdikas in 700 BC and was politically independent until AD 148 when it became part of the Roman Empire. The question is now raised as to the ethnic identity of the people that founded the Macedonian State. According to Toukidid, one of most prominent ancient historians, the Macedonians were people different from the Athenians and he calls them ..barbarians" /Toukidid - 2.80.82/. In a manuscript by an unknown author preserved since the end of the 5th and the beginning of 4th century BC called ..Peri Politeias" the Macedonians are treated as something quite different from the Greeks and are also called ,,barbarians". We should also mention the irrefutable proof given by Demosthenes one of the most prominent figures in antiquity. In the renowned ..Selected Speeches of Demosthenes" /Bulgarian edition 1982/ one can read the famous diatribes against Philip II, the predecessor of Alexander the Great /336 - 323 BC/. The third diatribe reads as follows: ,,But Philip and his crimes are not treated like this any more. Not only is he no Hellene and has nothing in common with the Hellenes but he also has nothing in common with the foreigners of whom we speak with respect. He is an unworthy Macedonian, a country from which one cannot buy a single industrious slave" /p. 67/. His conviction that the Macedonians have no kinship with the Greeks is expressed by Demosthenes in his speech entitled ..About the Wreath". In it the calls on the listeners to read the inscription on the gravestone of the killed Athenian soldiers. The inscription reads: ,,They fought in order to free the Greeks from the burden of slavery and from the hateful impudence of the foreigners" - so it proves in an indisputable way that the Macedonian ruler Philip and therefore the Macedonians are not Hellenes which means that the name ,,Macedonia" originating from a ..barbarian tribe" cannot be subject of any claims on the part of present-day Greece. The ancient Macedonians were Illyrians just like the ancient Thracians. And when later in the 5th century the Slavs invaded the Balkan peninsula and settled there /including Macedonia/, the national composition of the country was completely changed and that is why the Romans called Macedonia "Slavinia terra" /Slav land/. When he talks of the ethnic background of the Macedonians, Jouguet acknoweldges claims that they were Illyrians or Epeirots, or a mixture of Greek, Albanian and Thraco-Ilyrian elements. Gjuha shqipe e ka historine e saj ne njesite e saj.Cdo njesi e saj tregon sa e vjetr dhe njekohesisht jep ne menure shume te qarte kodet ndertimore se si eshte ndertuar gjuha ne pergjithesi.Kjo eshte shume e dukshme ne kete gjuhe.Pikerisht kete duan te fshehin kur thone qe gjuha shqipe vjen nga Ilirishtja dhe trakishtja duke e ditur shume mire qe ato nuk kane lene libra te shkruar. Gjuha shqipe eshte perdorur per te ndertuar gjuhet e europes duke filluar me gjuhen greke te vjter,gjuhen latine,gjuhet sllave ,gjuhet anglosaksone,gjuhet nordike.Deri reth shekullit te 10 pas eres sone ,ka shume mundesi qe shumica e popujve te europes kishin si gjuhe te folur,gjuhen shqipe.Ekstiston nje dallim i madh midis gjuhes se folur dhe gjuhes se shkruar.Gjuha e shkruar i perket elitave.Gjuhet e shkruara te vjetra nuk jane perdourur aspak nga popujt deri vone reth shekullit te 14.Ato ishin gjuhe artificilae qe ndertoheshin ne baze te kombineve te njesive te gjuhes se folur,gjuhes shqipe.Gjuha shqipe ka qene e shkruar shume e shume kohe me pare para tyre.Psi u studjua dhe u kopjua teresisht,librat e saj u zhduken,o dogjen si libra paganesh e arsy et tjera,qe nuk po ip permendim ketu.Librat e kesaj gjuhe jane perdorur per te ndertuar deri ne gjuhen sanskrite dhe ato aziatike.Kjo e vertete e madhe eshte fsheur ne menyre sistematike nder shekuj nga kishat,xhamite,sinagogat dhe fete etjera si veda,budistet..sepse perdorem koceptet fetare te kesaj gjuhe dhe i konvertuar sipas qejfit te tyre te zot,allah...Duheshin zhdukur faktet e shkruara qe vertetonin te kunderten dhe tregonin genjeshtren e madhe te diktatoreve&mbret&zot. Gjuha shqipe shpetoi vetem nga karakteristikat e kesaj race.Kjo race ka nje luan te madh perbrenda.Kjo race ka drejtuar shtetet kryesore qe nga Faraonet e Egjyptit,perandoria e Romes,Bizantine deri ne perandorine e fundit Osmane.Hostorine e saj e eleminoi vetem Kisha dhe Xhamia per interesat e tyre fetare. Gjuha e Maqedonise dhe Ilire eshte lidhur me gjuhen greke aq sa eshte e lidhur gegerishtja me Tzamerishten,te cila perbejne ne te vertete,respektivisht gjuhen Ilire_Maqedonase-Thrake(gegerishtja) dhe gjuhen greke (tTamerishtja).Gjuha Helene ka qene gjuha e kohes kur midis gegerishte dhe tzamerishtes nuk kish filluar carje fonetike dhe alfabetike(alfabeti "grek" dhe "latin",te cilet jane alfabetet e dy dialekteve me te medha te gjuhes shqipe).Gjuha shqipe ka filluar te shkruhet me shkrimet Vinka,me vone mikenase,egjyptian,grek,latine.Fundi i ciklit te zhvillimit te kesaj gjuhe ka qene shekulli i 6 pas eres sone.Aty ka ndaluar zhvillimi i kesaj gjuhe madheshtore.Ka ndaluar pikerisht kur elitat e kesaj race u shkeputen perfundimisht nga populli dhe filluan t'perdornin gjuhen e re,te ndertuar nga te paguarit e tyre(prifterinte)i.Ata kishin ekonomin ne dore dhe mund ta benin lehtesisht nje gje te tille,por vetem shqiptaret,nuk e ndryshuan gjuhen e folur deri ne ditet tona.Kjo skeme vazhdoi deri ne shekullin e 19.Popujt filluan te shkruaje ne fund te atij shekulli dhe ne gjate shekullit te 20.Gjate procesit te shkrimit te gjuheve Europiane,i filluar 6 shekuj me pare Kleriket dhe aristokratet filluan mesim me detyrim te gjuheve shume te reja te ndertuar ne laboratoret e kishave per reth 1000 vjet,dhe kjo solli percarjen e madhe te qellimshme te gjuhes se folur. The name Edessa was ascribed an Illyrian origin by U. Wilcken, in his biography of Alexander the Great (noted by Walter Bauer 1934; 1971; ch. 1), the "town of the waters", due to its copious water resources and its tourist attraction of the waterfalls, located in the actual town center. The Ancient Macedonian name "Edessa" was commemorated by Seleucus I Nicator in refounding an ancient city in northern Mesopotamia: see Edessa, Mesopotamia. The name of the city in Slavic is "Voden/Воден" (derived from voda/вода, i.e. water), in Turkish the city can be known as either "Edessa" or "Vodine", and in Aromanian the city can be known as either "Edessa" or "Vudena", which comes from an alternative Greek name for the city Βοδενά Vodená. Sllavët kur e pushtuan Maqedoninë e kovertuan këtë emër në Воден (Voden) pra Ujë. Më intereson në këtë rast, cila bazë e fjalës EDESSA është përkatësja ilirishte për ujë? Une personalisht mendoj qe kjo nuk eshte shume e gabuar. Une mendoj qe iliret kane folur te njejten gjuhe me "greket" pa qene greke. Pra ajo qe ne e quajme greqisht ka qene gjuha e gjithe races ballkanike. Po perse eshte perdorur termi "barbar" ndaj disa fiseve? A nuk u perdor ky term per ata qe kan folur nje gjuhe jo-helene? Sepse une mendoj dhe jam plotesisht I bindur, qe barbar aplikohet per te gjithe religjionet pagane politeiste, kurse helenet ishin monotheist. Si mund te ishin monotheist ata duke besuar ne Athenen, Zeusin, Apollon etj ? Si je bind qe ishte term per fe te paganve? Po te veshtrosh me vemendje, vetem Apolloni eshte Hyu origjinal i heleneve, qe nuk ishin nje etni por nje theokraci, gjithe te tjeret ishin hyjni pellazge, bile helenet nuk mund te shkelnin ne tempujt kushtuar atyre. Mesa duket keto perendi u adoptuan ne panteonin e besimit helenik dhe filluan te adhuroheshin dhe prej tyre. Me sa duket paska pasur nje dalim gjuhesh ne kete Gadishull? Ndryshimi midis fjales 'gjuhe' dhe 'dialekt', eshte i brishte. Ne kete arsyetim , futet dhe gjykimi subjektiv i autoreve te lashte per te ndare nje gjuhe te huaj nga dialekti, pa folur per faktin qe ne gjuhen e vjeter greke, me dialektos kuptohej fjala gjuhe, sic kuptojme ne sot nje gjuhe te huaj. Por po, ka pasur disa gjuhe, qe megjithese gjithe filologjia moderne kembengul te kene qene gjuhe te popujve, une kembengul qe kane qene gjuhe te feve, qe ju dhane emer dhe popujve.